Take a breath, sip some tea, and stay a little while. 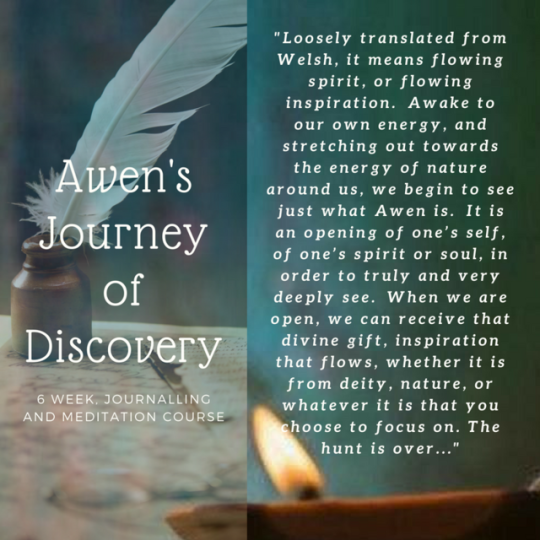 That is what Melinda said after completing her 6 weeks of Awen’s Journey of Discovery course. Melinda, isn’t a meditator, she doesn’t even keep a journal. However the tools, steps and insight she obtained in this course, really gave her what she needed to let go of old thoughts and habits, and move forward into her bright new future. This is a course for everyone. Within this 6 week period I share with you, my favourite, (tried and tested) ideas and techniques to help you become your ‘best self’. 🌿Learn to trust your intuition. 🌿Get to know yourself deeply. 🌿Discover new ways to release stress. 🌿Find ways to support yourself in every day life, and in complex situations. 🌿Change the way you communicate. 🌿Bring positive change, love, and trust into your life. Monday evenings, 7pm, 6 weeks. Book by replying to this email or online by clicking book now.